Review: They had come into a country that was strangest of all countries, and amongst people that were the strangest of all peoples. This is exactly how I felt when I read the first chapter. I was completely confused. What is going on? I kept reading and was better able to understand the plot. The Golden Fleece is about Jason and the Argonauts. Jason and the Argonauts are aboard the Argo, on their quest for The Golden Fleece for Greece. Jason must get The Golden Fleece, in order to have his father claim the throne again. Many heroes like Polydeuces and Orpheus willingly go aboard the Argo, to join in the quest of the Fleece. As this journey progresses, people join and depart from the Argonauts. The Argo has to stop at lots of islands and the most of the Argonauts gain love interests along the way. The Argonauts have to face multiple difficulties, including Cerberus (the three-headed dog) and the Maze of the Minotaur, where they eventually must face the Minotaur. Gods are helping even the most famous heroes in their time of need. This 89 year-old book (as of 2010) has been loved by many people, especially kids. There is a plus point in every part of the story. When the characters mention a hero, it often includes the myth of the hero. This really helps when you have a limited knowledge of who the hero is. I also like that the dialogue reads as if you are in Ancient Greece. For example: "Oh, make haste, ye who can help me!" It helps that the pictures are very accurate because when I am confused about an action a character is doing, I can just look at the picture. I rate this book 4 out of 5 stars because it took me longer than it usually does to get me hooked. There wasn't much action at the start, and I was kind of bored. Once I got to the action part of the story though, I started to really get engrossed in the book, as if I were watching a movie. The Golden Fleece is a really good book, and to people who read the Percy Jackson Series, they should read this book. We would like to thank Random House for providing a copy of The Golden Fleece and the Heroes Who Lived Before Achilles for this review. 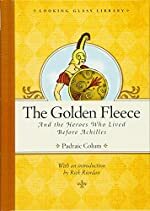 Have you read The Golden Fleece and the Heroes Who Lived Before Achilles? How would you rate it?